Part 1 is a review of my first dinner at Scarpetta, the restaurant in Miami Beach, with other locations in New York City, Las Vegas. Beverly Hills and Toronto. Part 2 is a review of the terrific cookbook, including the mistake I found and the publisher’s follow up. Part 3 details my second dinner at the restaurant, after being invited for “V.I.P.” treatment as a gesture for finding the above mentioned error. I am a long time fan of Chef Conant, from his appearances on Top Chef and as a judge on Chopped, but I couldn’t really appreciate his food until I ate at his restaurant, Scarpetta in Miami Beach. September is Miami Spice month, when many of the best restaurants put out a special price fixed menu. Scarpetta particpates, and the menu was truly exceptional. The food was perfection, from the breads and spreads to the pasta to the fish to dessert. It is a beautiful restaurant, located in the Fontainebleau Hotel on Miami Beach, but not in the least bit stuffy. Service was superb. Our waiter, Giancarlo, was a pleasure. We really lucked out with the Miami Spice tasting menu, a three course meal for $39. Giancarlo assured us that the dishes on the Spice menu were selected from the regular menu and portion sizes were identical, making this an excellent value. They brought us a bread basket that the server explained contained sourdough, stromboli, foccacia, etc. that was served with a three compartment tray holding marscarpone butter, herb & citrus infused olive oil & eggplant caponanta. All were outstanding. We emptied all those compartments. For the first course, I started with the Mozzarella in Carrozza, a Buffalo mozarella in a light breading that was served over stewed cherry tomatoes. It was crispy, not at all greasy, and the cheese was luscious. My husband had the Mediterranean Octopus with potatoes, capers & olives ($5 supplement,) which was cooked perfectly and paired with a smoky sauce. We then shared the pasta, Spaghetti with Tomato & Basil ($12 supplement) a half order of Scott Conant’s famous pasta. It was, in a word, perfection and deserving of all the accolades it has received. For our mains, I ordered the Snapper with Cauliflower & Caper Salmoriglio, a variation from the online menu of diver scallops. The snapper was moist and buttery with a crispy skin and the cauliflower was turned into a sauce as well as small delicious bites. My husband had the Duo of Kurobuta Pork, pork tenderloin, pork belly, fennel & citrus and he loved every bite. He had a similar dish in NYC at Gramercy Tavern, and declared Scarpetta’s the winning dish of the two. For dessert I ordered the Polenta Crusted Cheesecake, with fresh strawberries & strawberry sorbet, and it was truly divine. The cheesecake had a strawberry gelatin type topping which I don’t usually care for, but this was really good, as was the unusual and delicious polenta crust. The sorbet was a punch in the mouth of strawberry. My husband had the Bicerin Parfait, praline, coffee gelato & baci di dama ($5 supplement) and he devoured it. I didn’t even get a taste! Although to be fair, I was so full I couldn’t eat more than a bite or two of my own dessert. We also selected the wine flights for this meal, mine the classico ($20) and my husband the riserva ($30) and all the wines were excellent. The service was wonderful. The staff were on top of everything, from removing dishes to wiping up crumbs, yet were never obtrusive. Giancarlo explained every dish and was warm, welcoming and everything a good waiter should be. We loved it. After that experience, when I heard Chef Conant was releasing this cookbook, I begged an advance copy and went to work. I started with the Caponata, which was one of the simplest recipes for this dish that I’ve ever made, basically onions, tomatoes and eggplant. It seemed a little light on the eggplant, I would use more next time I make this, but it is creamy, sweet and just yummy, especially spread on toasty bread. Then I decided to tackle his most famous dish, Spaghetti with Tomato Basil. This deceptively simple dish is sublime, and didn’t seem all that difficult. The recipe for the sauce is different from any tomato sauce I’ve ever experienced, and while I was skeptical of the amount of olive oil, figuring it would be a greasy sauce, I was wrong. The sauce emulsifies beautifully and is the simplest and best tomato sauce I’ve ever made. However, I ran into a problem with the spaghetti, the ratio of dry to wet ingredients seemed off to me. But since it was the first time I was making the pasta, I decided to follow the recipe as written, but wasn’t really surprised to find it made an unworkable dough. After contacting the publisher, a flurry of emails were sent between me, the publicist and finally the editor. The editor then had Chef Conant’s kitchen prepare the recipe as published. I was subsequently informed that I had found a mistake. I was told that when Chef Conant’s restaurant recipe was converted for the cookbook, an error was made – instead of 5 cups of flour, as published, it should have been 3 1/2 cups. That ratio makes more sense, and I was told that it will be corrected in future printings. The corrected recipe makes a very rich and delicious pasta that pairs perfectly with the sauce. On a side note, a few months ago I watched a fabulous interview with Alex Guarnaschelli, a Google Talk (rather like a Ted Talk, but considerably longer; this one runs close to an hour.) I learned that her mother, Maria Guarnaschelli, is a cookbook editor extraordinaire, and has edited some truly iconic cookbooks like The Joy of Cooking, The Cake Bible, The Splendid Table, and so on, all of which are still in print. Alex talked about how her mother cooked every single recipe in those books, some several times, to make sure they were perfect. Apparently that way of editing cookbooks is a rare and wondrous thing, and was obviously not done here. I also need to add that in no way do I hold Chef Conant responsible for this error; it was completely up to the editor/publisher to check for these types of things and if found, to correct it. If the book goes into a second printing I can only hope that they will. Most of the recipes in this book are straightforward and truly rely on good quality ingredients, and they shine here. There are tips throughout the book, from where to shop, wine pairing, and suggestions for leftovers. The beautiful photography is just the icing on the cake, pushing this beyond just a cookbook to fabulous gift book. This is well on its way to becoming a favorite. All that said, this is not a cookbook for beginners, but should work beautifully for adventurous cooks who are comfortable in the kitchen. So after the spaghetti recipe debacle, I received an email from the publicist suggesting I try the restaurant. 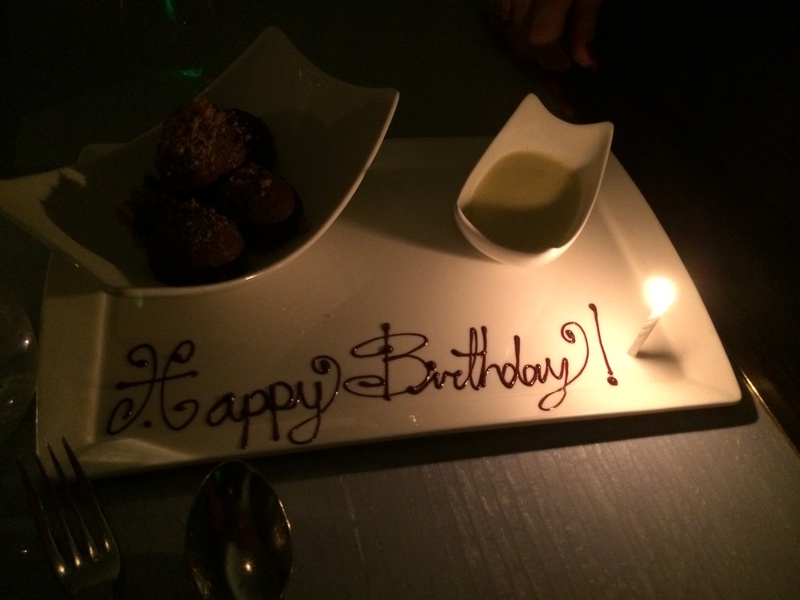 My birthday was coming up, and I have a good friend whose birthday is a couple of days after mine and we always celebrate together so I thought why not – he hadn’t been to Scarpetta and we had loved it. I made a reservation through Open Table, then sent the details to the publicist who assured me that we would be receiving “V.I.P.” treatment. I didn’t know what that meant exactly, but I’m sorry to say what we dealt with wasn’t even close. The hostess greeted us effusively, handing me a birthday card. Our waiter seemed efficient, but after giving us menus he disappeared, to be replaced with a flighty waitress. I asked about the branzino since I’ve never had it, and she proceeded to tell me a long story about how other restaurants prepared it, but never did tell me what type of fish it was or how it was prepared at Scarpetta. I went with the black cod instead. The sommelier excelled at recommending the most expensive wines on the menu. The famous “Spaghetti with Tomato & Basil” came served with a domed lid, yet was barely warm; it had obviously been sitting for a while before we were served. My black cod was severely undercooked, cold in the center and too raw to flake. The special of the night was a $70 pork osso buco for 2, which was served in a giant lump of meat & bone in a tiny dish. The restaurant was dark yet we were told to help ourselves. We politely asked the waitress to serve, and she struggled to find a way to do so. The meat was flavorless, dry and stringy. We had to ask for more gravy, there was a tiny bit on the bottom of the dish that we couldn’t figure out how to get without turning the meat out as well. I did get a “happy birthday” written on my dessert plate; my friend did not, even though we had told them we both were celebrating. The difference between this dinner, on a Saturday night in December, and our first experience on a Sunday night in September, was monumental and unacceptable. By the way, this is the restaurant that has Top Chef Season 11 runner-up Nina Compton at its helm. We spent over $500 on dinner for four with a few glasses of wine. It was a very long night with disappointing food and service. If this is Chef Conant’s idea of V.I.P. treatment, I’d hate to see how everyone else fairs. I certainly didn’t expect a free dinner, but a drink would have been nice. Or a dessert. Or some kind of recognition that we weren’t just another table they had to turn. To add insult to injury, OpenTable had sent me a form for comments about dinner and I told them pretty much what I’ve written here, which gets forwarded to the restaurant. Scarpetta has yet to respond. I’ll keep making Chef Conant’s food and recommending his cookbook, but I won’t go back to his restaurant. THE SCARPETTA COOKBOOK by Scott Conant. Houghton Mifflin Harcourt; 1 edition (October 15, 2013). ISBN 978-1118508701. 384p.